Meanwhile, within the device there’s plenty going on: it starts by preparing the blood sample. Red blood cells are separated from the blood and the plasma that remains is guided onto the biochip. When patients are suffering from sepsis, their immune system reacts by producing certain proteins. 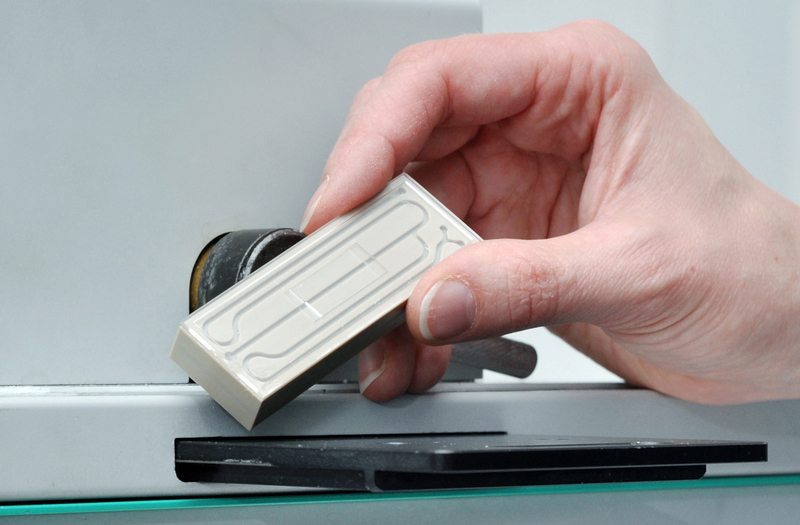 The biochip uses these in its diagnosis: there are antibodies positioned on the chip which fit these proteins like a key fits a lock. If the proteins are present in the blood, the antibodies fish them out of the fluid and bind them to the chip. But how does the apparatus know if proteins have been caught? “The chip is rinsed with a solution containing the appropriate antibodies, which have in turn been marked with a fluorescent dye,” explains IPM scientist Dr. Manuel Kemmler. “These bind to the proteins – meaning antibodies, protein and marked antibodies are all firmly linked to each other and to the chip’s surface. When the chip is illuminated, the dye lights up.” The apparatus sees lots of little illuminated dots that show the protein was in the blood. If the patient is healthy, however, the chip remains dark. Together with colleagues from a university hospital, the researchers have already successfully tested prototypes of the device and biochip. Each biochip can only be used once – so they have to be affordable. “We predict that in the long run, with production on a large enough scale, each chip will cost no more than one euro,” says Brandenburg. There are various possible applications: other conditions such as heart attacks or cancers can also be investigated this way. What’s more, the chip facilitates doping and urine testing as well as the quality assessment of foodstuffs.